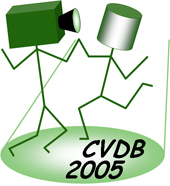 Thanks to a sponsorship from Reykjavik University, CVDB 2005 is proud to announce an award for the best "student" paper! The winner of the award is Bin Liu of Georgia Institute of Technology, USA, for his paper "A Live Multimedia Stream Querying System", co-authored by Amarnath Gupta and Ramesh Jain. This excellent paper presents a very novel system, and essentially opens up a new research area at the intersection of the computer vision and sensor database areas. The sum of $800, as well as free registration to both CVDB and SIGMOD is awarded to Bin Liu.